I Love Agata & Valentina! They always come through. When I saw the photo of the pork shoulder ragu on Food52 a few weeks ago I knew I would have to make it as soon as possible. We were planning to go into New York so I called my favorite butcher Pino to order the pork shoulder and then we stopped by Agata & Valentina for the handful of fennel called for in the recipe. After spending about 20 minutes with Jeff, the store manager, sorting through the large selection of spices, we realized that they were out of fennel. I explained why it had to be fennel, saying that it is the predominant spice in Italian sausage. Joe asked me to wait for a few minutes while he asked the store butcher if he had any left, saying he had been making sausages that very week. I waited at the cash register and just as I was about to leave, Ramon, the meat manager appeared, much to my astonished joy, with a little package of fennel as a present. I have to explain that neither Jeff nor Ramon knew me or that I am a food professional. I'm certain it was a combination of my intensely conveyed longing to have this ingredient but mostly the store's policy of supportive neighborly consumer service. People might except this in a small town but not usually in New York! See why I love them? 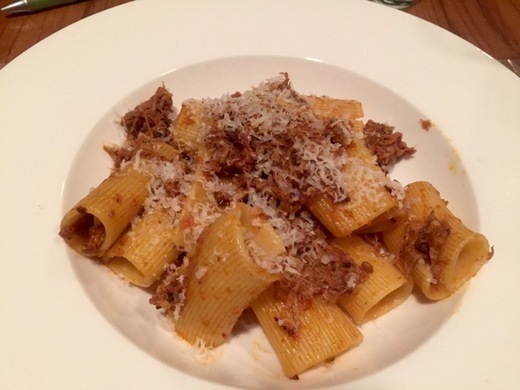 The ragu was soul satisfying accompanied by a 2012 Joseph Swan pinot noir. The brandied cherry ice cream was dessert. Happy New Year!